Author Jim Miller’s son, Walt, on right, with friend. Opening week is upon us and the Padres ownership debacle has already done a lot to dampen the spirits of local baseball fans even before the first pitch has been thrown. With Jeff Moorad unlikely to ever take over the majority share of the team from John Moores, many fans rightly feel they have been bamboozled once again–left to sit in a park that their tax dollars built and pay through the nose for bad baseball and overpriced beer while the swooning friars stumble uncertainly around the bases toward yet another losing season. If you watch the Vegas line, the Padres are picked to finish last in the National League West with only 70 wins. Oh, the horror! But, of course, that is the destiny of the Padres fan: losing. As I only half-jokingly tell my friends, I have taught my son to love baseball and love the Padres so he knows from a young age the first noble truth: life is suffering. That said, if we can let go of the vainglorious illusions that make us suffer, we are left with things themselves. In this case, we are left with the game itself. And it’s a beautiful game too. 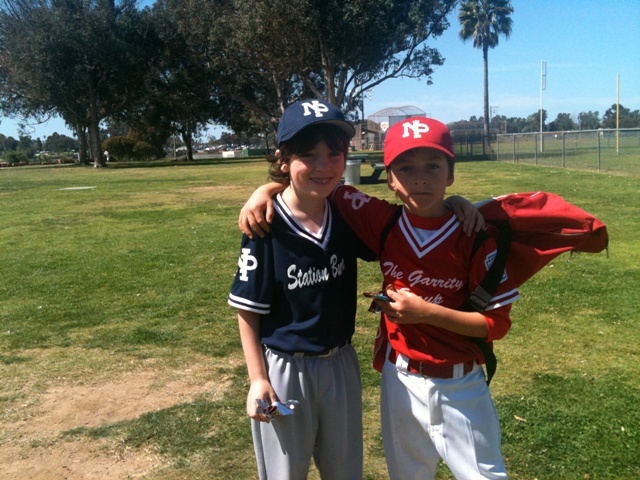 When I take my son out to play for the North Park Little League Padres, I think about what Walt Whitman observed in baseball’s infancy, “I see great things in baseball. It’s our game – the American game. It will take our people out-of-doors, fill them with oxygen, give them a larger physical stoicism. Tend to relieve us from being a nervous, dyspeptic set. Repair these losses, and be a blessing to us.” And a great blessing it is. Baseball is about work and practice, but, at its best, it is about the best kind of work and practice. It is craft rather than alienated labor. And though there is competition and hard work in the game, there is also pure physical joy, grace of movement, and play. Unlike all of our other games that mimic the workplace by restricting play in a prison of measured time, baseball is timeless. In our sundown perambulations of late through the outer parts of Brooklyn, we have observed several parties of youngsters playing “base,” a certain game of ball. We wish such sights were more common among us. In the practice of athletic and manly sports, the young men of nearly all our American cities are very deficient—perhaps more so than those of any other country that could be mentioned. Clerks are shut up from early morning till nine or ten o’clock at night—apprentices, after their days’ works, either go to bed or lounge about in places where they benefit neither body nor mind—and all classes seem to act as though there were no commendable objects of pursuit in the world except making money and tenaciously sticking to one’s trade or occupation. Now, as the fault is so generally of this kind, we can do little harm in hinting to people that, after all, there may be no necessity for such a drudge system among men. Let us enjoy life a little. Has God made this beautiful earth—the sun to shine—all the sweet influences of nature to operate and planted in man a wish for their delights—and all for nothing? Let us leave our close rooms and the dust and corruption of stagnant places, and taste some of the good things Providence has scattered around so liberally. We would that all the young fellows about Brooklyn were daily in the habit of spending an hour or two in some outdoor game or recreation. The body and mind would both be benefitted by it. There would be fewer attenuated forms and shrunken limbs and pallid faces in our streets. The game of ball is glorious. Glorious indeed. Thus when I head out to help coach some of the very young fellows of San Diego as they play the game of ball, I do so with a light heart. 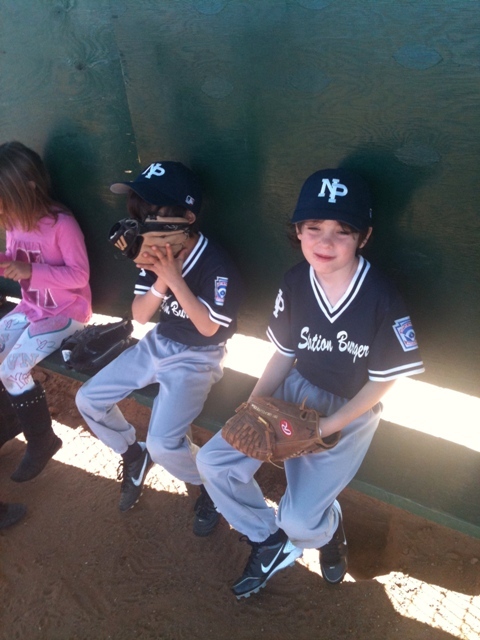 Most of the six to eight year olds ignore me when I shout at them to pay attention or throw the ball back to the pitcher. Good for them. 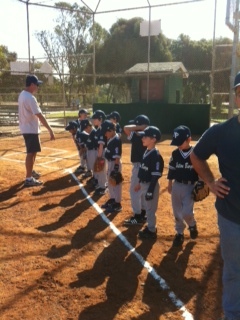 They are busy doing funny little dances in the outfield or digging in the dirt by second base. Once in a while, they’ll miraculously catch a ball or, more likely, get a hit and scurry around the bases as fast as their little legs can carry them. These are moments of pure joy. Moments that that are, as a good friend of mine recently told me, “the best times of life.” And you can see it sometimes in the faces of the parents fresh from the “close rooms” of their workplaces—losses being repaired as they taste one of the great good things in life. But even more moving than that to me is the wonderful anarchy of this child’s play before the boys and girls learn the “rules of the game.” Something about it suggests to me that there may be no necessity for the “drudge system” among us. Play ball! I love the Whitman quote about “daily in the habit of spending an hour or two in some outdoor game or recreation”… the older I get, the more firmly I believe we humans need at least a full hour of enjoyable exercise each day, ideally outdoors. The poetry of baseball, baseball as poetry, exists in one of my favorite poems “Teaching the Slider” by JT Barbarese. As the alleged “official” OB Rag sports guy, I’m finding it extremely difficult with each passing year to generate any excitement whatsoever for baseball season. To me, baseball is merely something to tie me over between the hockey playoffs and football season (not to mention Aztec basketball). These days, though, on the extremely rare occasion that I do trek down to Petco Park, it’s more likely to be a part of a social/drinking gathering than it is to actually watch baseball. In a day and age where a team’s competitiveness is directly tied to it’s ability to write $150 million or more worth of player salary checks, the Padres are just not worth paying attention to anymore. At least in the NFL the salary cap ensures that there’s parity; that a team in even the smallest of NFL markets can compete for a championship with the right personnel moves and savvy draft picks. These days it’s just not worth paying Major League prices to see a sub-Triple A team play in a baseball cathedral. And with the ownership situation what it is, we shouldn’t expect any better anytime soon. It’s no wonder Jason McLeod jumped ship to the Cubs: He knew what was coming. It’s just hard to get excited about baseball in San Diego these days.